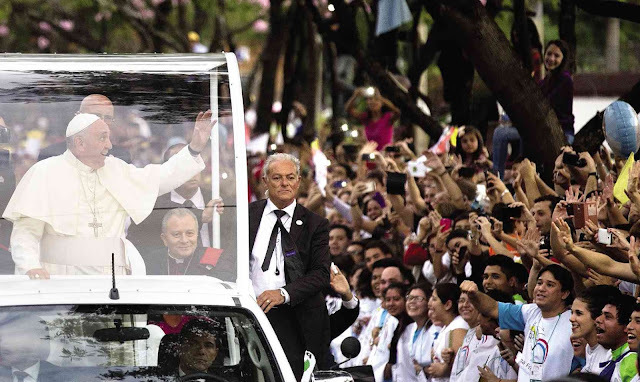 The 78-year-old Pope—in Paraguay on the last stop of a three-nation tour of South America—also railed against ideologies and hammered home the central theme of his trip to his home continent: Equality. “Look what happened with ideologies in the last century … they ended in dictatorships, always,” he added, applause ringing out in response during the gathering attended by Paraguayan President Horacio Cortes. As he had done on previous stops during his trip, first in Ecuador, and then Bolivia, Francis called for an end to poverty—also endemic in the region—and lamented today’s consumer society. “Putting bread on the table, putting a roof over the heads of one’s children, giving them health and an education—these are essential for human dignity, and businessmen and women, politicians, economists, must feel challenged in this regard,” Francis told the gathering of business leaders, politicians, labor union leaders and other civil society groups. “In economics, in business and in politics, what counts first and foremost is the human person and the environment in which he or she lives,” he said. In a rare occurrence, the leader of a gay rights group took part in the gathering at the invitation of local Catholic bishops. “I left with the impression that the Pope really wants to change things,” Simon Cazal, director of SomosGay (We Are Gay), told Reuters after the meeting. The Catholic Church teaches that homosexual tendencies are not sinful but homosexual acts are. Catholic gays have contested the Church’s ban on homosexual activity, saying it deprives them of the intimacy that is part of a loving relationship. Saturday was believed to be the first time a gay rights activist was known to have been invited to attend an event during a papal trip. One theme of a major meeting of Catholic bishops at the Vatican in October will be how the Church can reach out to homosexual Catholics.